Living with cancer can completely change life as you know it. It disrupts plans, stresses relationships and affects the way you function day to day. Although treatments like chemotherapy and radiation therapy may effectively eradicate some – if not all – of the disease, the side effects (pain, nausea, vomiting, diarrhea, fatigue and/or insomnia) are often debilitating. According to doctors at the Massachusetts General Hospital Cancer Center, palliative care improves quality of life for patients and their families. The Mass General palliative care team of physicians, clinicians, nurses, social workers and psychologists has expertise in symptom management. “Our palliative care expertise can help alleviate these symptoms and help patients and families live the best way possible for as long as possible, making the burden of treatment less,” Areel El-Jawahri , MD, who led a study on the benefits of palliative care for bone marrow transplant patients, says. Unlike hospice, which focuses on end-of-life care, Mass General utilizes palliative care treatments from diagnosis through all stages of cancer. They are uniquely designed to meet each patient’s individual physical, emotional, social and spiritual needs. All make living with cancer easier to cope with. Mass General pioneered the integration of palliative care into outpatient cancer care, also employing it both in hospital and at home, beginning early in the treatment process. 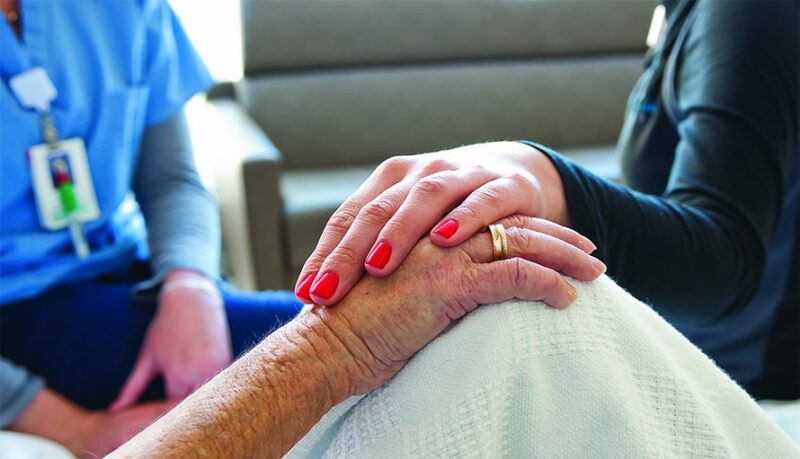 Mass General researchers have shown that when some cancer patients begin seeing palliative care providers early, they are 50 percent less likely to experience depression, have an improved quality of life and sometimes live longer. In their book Living with Cancer: A Step-by-Step Guide for Coping Medically and Emotionally with a Serious Diagnosis, Vicki A. Jackson, MD, MPH, and David P. Ryan, MD of MGH, help patients determine what living well means in the context of cancer. Dr. Jackson, a palliative care physician and chief of Mass General’s Palliative Care Division, and Dr. Ryan, chief of Hematology-Oncology and clinical director of the Mass General Cancer Center, often collaborate in caring for cancer patients. As a leading cancer care provider in the United States, Mass General provides exceptional compassionate, personalized cancer care. “We’ve come to appreciate that a collaboration between medical oncology and palliative care is powerful and often necessary for patients to get the best chance at their best-case scenario,” Dr. Ryan says. When you begin your cancer treatment at the Mass General Cancer Center, your team of medical professionals can present you with a comprehensive palliative care plan. It may include medical therapies (i.e., chemotherapy, radiation therapy, medicine, surgery) that addresses the cancer itself, along with pain-relief techniques (relaxation and acupuncture, for example) and emotional support for patients and families. In addition, experts may be called in to assist with financial and legal worries, or help with questions regarding spiritual concerns. As disorienting and tumultuous as living with cancer can be, palliative care, as part of the Mass General cancer treatment plan, can help you live your best-possible life.